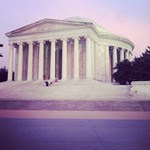 Early last week I found out I would be making a last minute trip to D.C. this week. If you couldn't tell by some of my previous work-related-travel-posts... I don't like to travel for work. I get very anxious and nervous, and I swear the time I am away from home literally creeps by. It taunts me and sticks it's ugly tongue out just to rile me up. Normally, I have lots of time to process and mentally prepare for travel/trips, but because I found out on Wednesday that I would be flying out on Sunday - the mental preparation was nonexistent and I just had to go with it. Part of me thinks that might even be better than having time to mull things over. 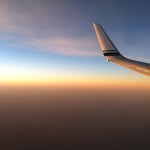 I flew out on Sunday afternoon on a direct flight from SeaTac to Reagan. Even though the flight was filled with crying children and smelled of feet and flatulence - it wasn't so bad. At least the view was gorgeous. Even though it doesn't sound like it - I am trying to make the most of the trip and my "alone time." 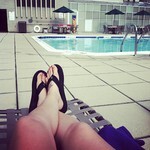 I've spent the afternoons reading my pregnancy and childbirth books by the pool. I didn't bring my bathing suit and the sun hasn't really been out all that much - but the heat and humidity have been a nice break from the cold and stuffiness that is my hotel room. My cousin, Kristen, lives out here so we have gotten to spend some quality dinner-time together, which of course I love. We had dinner at a little place called Cheesestique*. * Don't ask me how many times I tried to say "Cheesestique" over the phone to Ryan. It was a lot and he still didn't understand what I said. Kris thought I would enjoy having some baked mac 'n cheese (duh!) but we discovered that it was made with unpasteurized cheese. Boo. The thought of coming down with listeria and possibly hurting this kicking baby boy just didn't seem worth it. So, Kris ate some unpasteurized cheese for me. 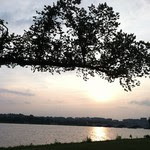 Last night we had a lovely Panera picnic on the Potomac, and luckily - it smelled better than the last time I was near it. 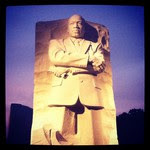 We walked quite a bit and visited the FDR Memorial, Jefferson Memorial, and Martin Luther King, Jr Memorial. All amazing and unique in their own ways. While reading some of FDR's quotes, I found myself thinking over and over about how relevant his thoughts and ideas still are today. Maybe now more than ever. I will fly home Friday night after class is over. Hallelujah. I miss my honey and puppies. Like, woah. Wow, thanks for the warning, work! At least you couldn't freak out too much because you weren't given a lot of time to do so! Also, looove all the photos! Did you bring your Big Girl camera too? !